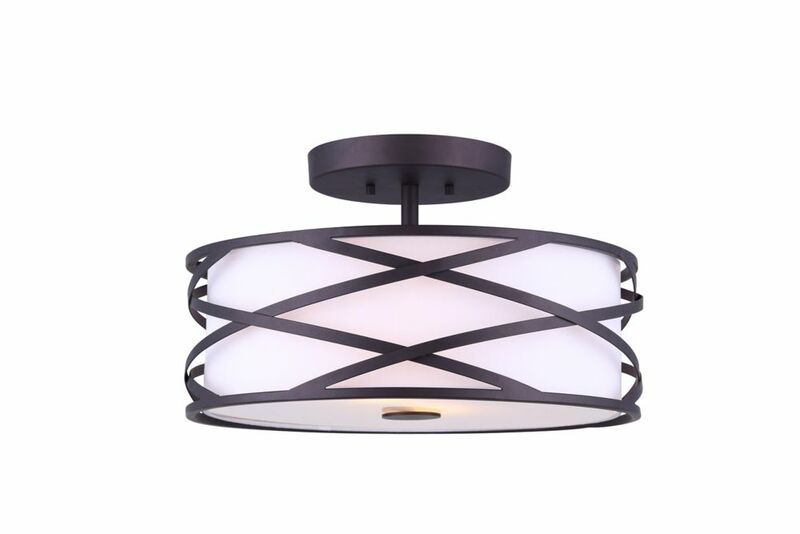 The CARLINA flush mount features an oil rubbed bronze finish with a white fabric shade. The unique caged design adds extra appeal to this fixture and is perfect for your bedroom and hallways. This 3-Light Pendant offers elegance that goes unparalleled. With a circular-shaped design frame in an espresso finish and covered with clear glass, this pendant will enhance any room with a gorgeous glow and exceptional styling. Hardware is included for easy installation. Modern to contemporary home style elongated pendant shown with filament bulbs (not included). Straight lines and geometric shape adds sophisticated style. Perfect for minimalist and industrial dicor styles over dining area. Carlina 2-Light Semi-Flushmount Light Fixture in Oil-Rubbed Bronze The CARLINA flush mount features an oil rubbed bronze finish with a white fabric shade. The unique caged design adds extra appeal to this fixture and is perfect for your bedroom and hallways. Carlina 2-Light Semi-Flushmount Light Fixture in Oil-Rubbed Bronze is rated 4.6 out of 5 by 45. Rated 5 out of 5 by Claude from good quality We are happy with the style and they look really good. Rated 4 out of 5 by Jennifer from It was relatively easy to install and it looks great... It was relatively easy to install and it looks great in the hallway. We're pleased. Rated 5 out of 5 by HomeDepotCustomer from Very stylish and fun. Love it! ... Very stylish and fun. Love it! Rated 5 out of 5 by Justin from Great light!... Great light! Rated 5 out of 5 by Sarah from Looks great in our low ceiling foyer and laundry room... Looks great in our low ceiling foyer and laundry room for a fancier laundry room light! Rated 5 out of 5 by Michelle from Beautiful light fixture Beautiful light fixture. Creates great lighting. Easy to install. Recommended! Rated 4 out of 5 by Nat7 from Nice light for the price. Overall, this light was what we expected and we like how it looks. Only downfall is things don’t align perfectly but it’s not that noticeable.